Twenty years ago Chris Hani, the man who spent 30 years in exile with the ANC, was assassinated outside his Boksburg home. According to former president Nelson Mandela he was “one of the greatest revolutionaries the country has ever known.” His death was one of the key turning points in the transition to democracy, his life an example to all who abhor oppression. That was forgotten at his grave on Wednesday as Tripartite Alliance leaders couldn’t resist using the podium to jibe one another in a battle far from the values of Hani and his Umkhonto we Sizwe. By GREG NICOLSON. The story of his opposition to ending the armed struggle is well known. Chris Hani, who spent years in exile leading the ANC’s military wing and naturally had misgivings about ending the armed struggle against the Apartheid state, was considered second in popularity and political influence only to Mandela himself. He commanded MK from Lusaka and was responsible for its missions and the macabre consequences that came with both success and failure. He protested when the party wanted to negotiate rather than fight, but he accepted the party’s decision and spent the last weeks of his life using his influence to convince ANC members to become “combatants for peace”. Speaking at the Thomas Nkobi Cemetery on Wednesday, President Jacob Zuma pointed out that while Hani could disagree with his leaders he was conscious of the boundaries of the ANC. Zuma didn’t mention names, but his comments were an obvious retort to the Julius Malemas of the party and in particular to Planning Minister Trevor Manuel. Zuma, who regularly blames Apartheid for the challenges still facing South Africa, hit back on Wednesday. “To suggest that we cannot blame Apartheid for what is happening is in our country is a mistake, to say the least,” he stated bluntly while facing Hani’s widow Limpho and daughter Lindiwe and a crowd of Communist Party and ANC supporters in a tent erected in the cemetery. “I’m just underlining the point because it became topical in the last few days. I think it’s a mistake to make that statement,” the president added to snickers from the crowd. He wasn’t the only speaker at the ceremony to use the occasion to settle political scores. The tension seemed clear in the seating plan. SACP general secretary Blade Nzimande, ANC secretary general Gwede Mantashe and Zuma talked together. The Hani family served as a buffer to Cosatu general secretary Zwelinzima Vavi who occasionally laughed with the rest of the crew but was notably distant. The Cosatu and Communist Party leaders engaged in a battle over leadership responsibilities, using Hani’s legacy as a proxy for their own battles. Vavi reiterated that Hani had said he did not want to join government and, rather, wanted to support the strengthening of civil society. Nzimande wasn’t going to let others appropriate the legacy of Hani or what he would have done. “We have no idea what he would have done today. But, he most certainly would have done what the SACP and ANC told him to,” he said. The Communist Party leader has been criticised for balancing roles as the head of the SACP, higher education and training minister, and as an ANC national executive committee member. 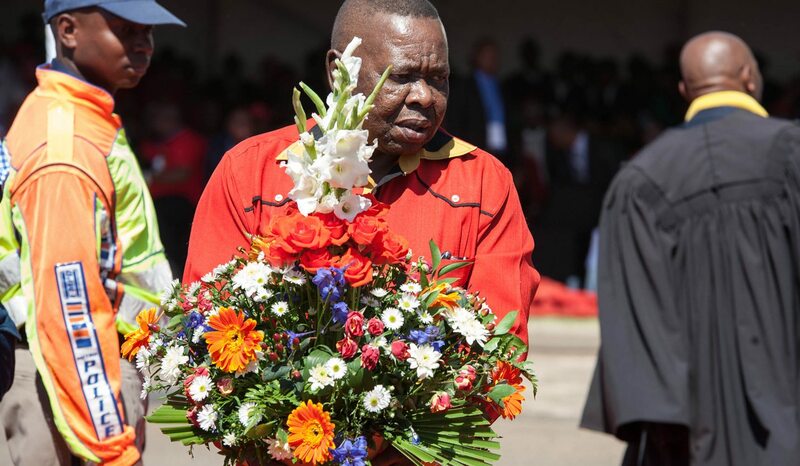 Hani wasn’t reckless and in the pursuit of unity Tripartite Alliance members must take responsibility for both successes and failures, said Nzimande. The comment seemed directed at Vavi, who continually warns of the country’s dire development situation. “We can’t cherry pick‚ behaving as though we are outside‚” said Nzimande in a fiery speech in which he also hit out at media for idolising Hani in what he said is an attempt to discredit current leaders. He told Cosatu that instead of calling for nationalisation of the economy the labour movement should try to use its members’ pensions for development projects. Infighting stole the show and with the country’s leaders squabbling only metres from the grave of the hero they were commemorating, Hani seemed to take second place on the day, a character used to further the interests of each speaker. But in reality they did have something informative, moving even, to say about Hani. Those comments, however, will be reserved for those of you who read the speeches. Because when leaders go off their prepared script and start calling people neo-nazis (like Nzimande called the media), what we see is not the honouring of a hero but the desecration of a man. The speech worth listening to was, in fact, one of the first. It came from Hani’s youngest daughter, Lindiwe, who reminded the crowd he was not just a man for the history books of South Africa, the ANC and SACP, but of a family. She remembered the days when he was in exile and phoned his children. “I didn’t realise my father was the Chris Hani until he had died,” she said. “Chris Hani was always my hero, but I did not realise he was the whole country’s hero.” Lindiwe remembered that when her father died she was told that she had to act brave “because the whole country was watching”. The daughter remembered her father, the man, not the idol for political expropriation.